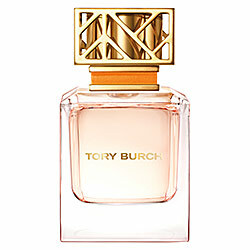 Scent Description and Notes: “The first fragrance from Tory Burch captures classic elements in unexpected ways: feminine and tomboy, easy and polished. Floral peony and tuberose blend with crisp citrus notes of grapefruit and neroli anchored by earthy vetiver—a bright and complex mix. The fragrance comes in a super-chic glass bottle with a signature fretwork top. Bottle Design and Artwork: I tested from the bottle itself, which is a small cubed bottle with an ornate, golden rectangular column-like cap with the initials emblazoned on top. ITB: It’s very floral, definitely from the tuberose and watered-down grapefruit notes. Interesting. Wet: It’s much more pungent due to the alcohol base and it burns my nose on first sniff. However, it’s heavily grapefruit with light peony, tuberose, and cassis underneath. I’m not getting anything woody or the deep tones of the sambac. Dry: Dry sandalwood, like just before it can be ground to powder, hints of neroli, jasmine sambac. It’s really rather nice. It doesn’t have a lot of throw, but it is nice and warm against my skin. Other Impressions: I’ve received a number of compliments while wearing this one. A student commented that I smell like spring, and my husband and his friend both said it smelled really good. I had no expectations for this one initially, but it really did make me happy wearing it and it does smell much better than I could have anticipated.